To all those overwhelmed brides out there, there's hope. You'll make it to the honeymoon. Scout's honor. AND you'll love your wedding day. What's my advice from a bride that made it through to the bliss on the other side? Be yourself. Check the bridezilla at the door. But express yourself in the ways that delight your heart and creativity. I'm not the traditional type and I'm also not the girl that has planned my wedding since I was five. No shame if you did, it just wasn't me! Plus, once you get the right man to marry everything is just little details that get you to the day when you get to pledge your love for one another 'til death do you part. That was always the light on the other end of the tunnel for me as well as the perspective that kept me off of the emotional roller coaster. Curious about what I did? Well, I'll tell you. I never wanted to get married in a building so I chose to get married outside at the Earle Harrison House in Waco, Texas. It is a fabulously green place, which is saying a lot when you live in Texas in the summer time. Kathy, the up keeper and gardener extraordinaire is extremely helpful. She'll set up your decor for you the morning off. Incredible! Not to mention she has great taste and rooms full of decor that you can use for free when you book them. Major score and major save! The EHH is a place where you can have both your ceremony and reception in the same place! We got married under a giant oak tree in front of this beautiful gazebo. We got married as the sun was setting, which for pictures made the lighting superb. Then we had our reception under a big white tent also on the property. I am a sucker for DIY/vintage as well as drawing inspiration from what you already have, aka being frugal. What was in my wedding toolbelt? Fabric, talented friends, old window frames, my mom's books from college, and a large collection of old records. 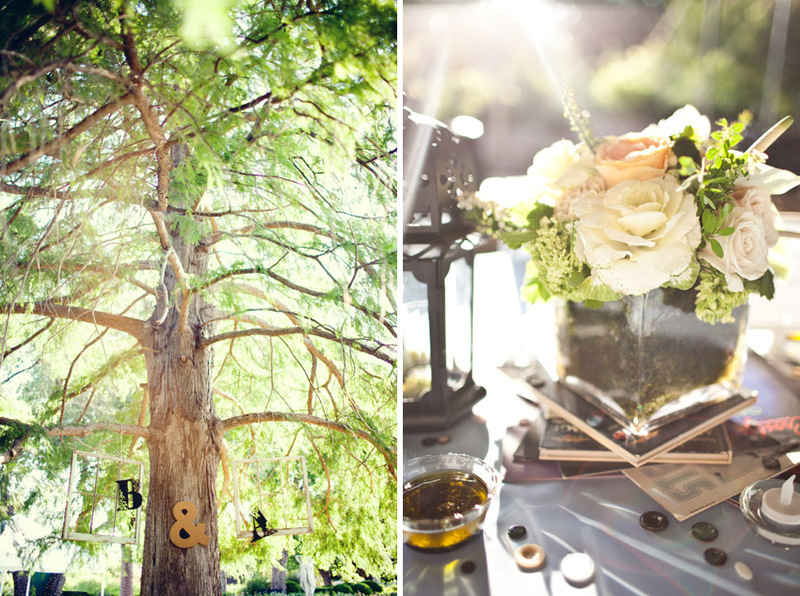 I had window frames hung from trees all over the garden as well as in the gazebo. I made a fabric over hang from strips of different white and cream fabrics that was hung above the spot where my groom and I stood. Then my centerpieces? So easy. I wanted them to be cohesive but all a smidge different. The base of the centerpieces were old records, with some old books here and there, lanterns, tea lights, smaller flower arrangements, and buttons. What a winning combo and really quite effortless. I had a beautiful and talented friend do all my flowers. Weren't they fabulous? I keep telling her she needs to start a business. Another advantage of getting married in a garden is that the area speaks for itself and you don't need a ton of decor to make the space look good. 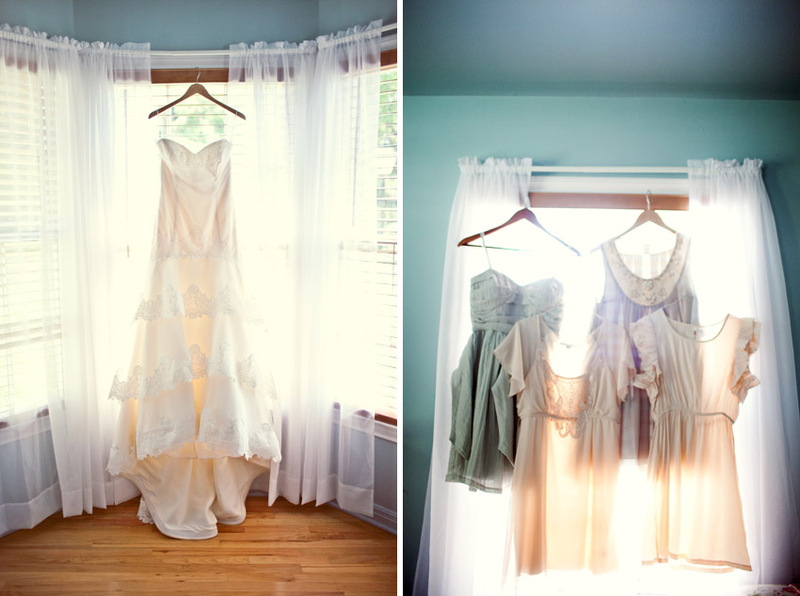 I chose a muted color palette of vintage pastels for my bridesmaids. Then I gave them the freedom to choose a dress they liked, within their budget, that flattered them, and one they'd wear again. They did a great job didn't they? Yup. For the groomsmen I hunted on Ebay diligently until I found some cheap grey suspenders and quirky/vintage inspired ties. I got their grey pants and shirts from JCPenny on sale! So their whole groomsmen outfit was around 30 bucks. I bet your jaw just dropped. Mine did too. I was pretty proud of myself. For my accessories, I got the earrings and necklace from XXI. I got the shoes from Marshall's. That large shiny object you see, my love gave me. Then I made a braided belt for my dress out of left over fabric from the overhang. So my overall accessories cost me under 60 bucks. And of course my killer dress, that until last week I haven't seen on another bride. I had only a few months to plan my wedding and needed to buy a dress in ONE weekend. I got my dress from the last store we went to and ended up walking out of the store WITH my dress. Another divine encounter. The dress had just come into the store and was exactly my size. No altering necessary. I talked with the manager and she let me have the sample dress for 10% off (a sweet trick to keep up your sleeve if you haven't gotten your dress yet). Since the sample had just come it, it was in mint condition, which of course if vitally important. For my cakes, I wanted several of different sizes and bought or made the cake toppers! I bought the little wooden bride and groom from a shop on Etsy. I made the stuffed fabric heart. I bought the wooden letters and heart, painted them, and then sanded them on the edges for a more vintage looking effect. What else is important for your big day? A stellar photographer. Who was mine? Taylor Lord. Fate brought us together. I am not even sure how I heard of her but it was destiny. I love the art of photography and thus was very picky on whose style was up to par to my visual standards. She more than made the cut. She has incredible taste and I love her visual style. Her pictures make me drool. She's personal, doesn't make you feel awkward, and she makes you look GOOD. Another note of advice, of course tell your photographer what you want, but also give them some room for creative freedom. They'll get you the pictures that you want, but if you give them more freedom to be themselves and go out of the box, they'll also give you the pictures you didn't KNOW you wanted. I didn't have a set list for Taylor, I essentially told her to have fun and do whatever she wanted. I'm probably every photographer's dream. As you can see, it worked out really well for me. You'll make it and you'll love it. Hope my tips were inspiring and encouraging!